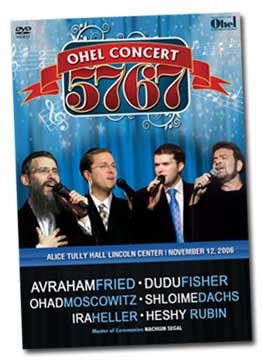 Sameach presents the OHEL 5767, this concert which took place at Lincoln Center , November 12th, 2006 features Avraham Fried, Dudu Fisher, Ohad Moscowitz, Shloime Dachs, Ira Heller & Heshy Rubin. This Double CD and DVD contains 27 tracks including a brand new music video and unreleased track from Avraham Fried, titled “Shabbos Candles,” This Double CD and DVD will be available in time for Chanukah. A video sampler will be release in the next week.